This unique triple bunk bed is perfect for your kid’s bedroom and ideal for small space living. Including three sleeping spaces for your children and providing side ladders to easily access each twin-size bed bunk. The bottom bunk is floor level, making is simple for the a smaller one to crawl in and out of bed. This solid pine wood triple bunk bed showcases a beautiful painted finish and includes support slats on each bunk, with no box spring needed. With guardrails on the two upper bunks for added safety. In a transitional and traditional design for a contemporary style that matches with multiple décor choices. 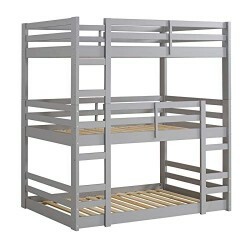 If needed, this triple bunk can be separated out into a low loft and a twin bunk bed when your kids grow older. With the top bunk turning into the low loft bed and the two lower bunks as a twin bunk bed. Does not include bedding and mattress.